To York U go the PanAm spoils! It was to be expected that part of the infrastructure built for the Pan Am games goes to institutions that can make best use of it. 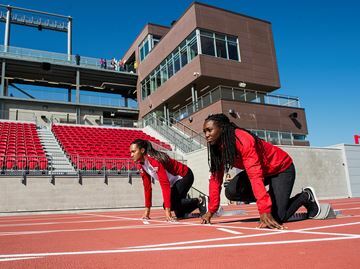 The keys to the Pan Am/Parapan Am Games athletics stadium in North York are in the hands of York University officials, as the venue has officially been handed over to the school. Sa�d Rafi, CEO of the Toronto 2015 Pan Am/Parapan Am Games organizing committee, handed over the keys to Mamdouh Shoukri, president and vice-chancellor of York University, at a ceremony Thursday, Sept. 17.